The DJI 5.8GHz Video TX & RX Antennas includes one 5.8GHz transmitter TX cloverleaf antenna and one 5.8GHz receiver RX cloverleaf antenna. 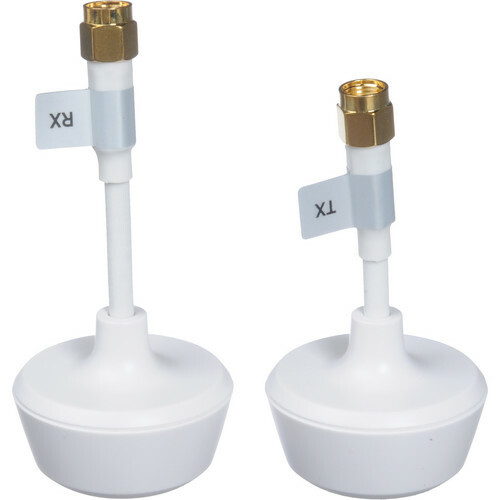 They're designed to attach to the DJI 5.8GHz Video Transmitter TX and 5.8GHz Video Receiver RX. Box Dimensions (LxWxH) 4.3 x 3.1 x 1.2"
5.8GHz Video TX & RX Cloverleaf Antennas is rated 1.5 out of 5 by 2. Rated 2 out of 5 by Twelvizm from Very Well Made, But... These some of the better clovers in mass production, but for the price, there is so much better. Check out the Mad Mushrooms, they are good for double the distance for the same price. And if you don't know what a helical is, find out before you buy something this expensive.Honestly, my $ @ antennas perform as well as these.These are much better than my 3DR clovers.If you want to keep all things stock and DJI, spend the money. If you want FPV range, do a little homework before dropping $. Rated 1 out of 5 by Nobody from Not sure yet I've tried these a few times with my Fatshark Attitude gear. So far... the stock whip antennas work better than these. Not really sure why. Maybe they aren't compatible.